The surfing history of the browser is practical, since one can easily find previously called websites. Disadvantage: even co-users of the computer can follow your surfing pattern. Since the websites called have been recorded in several places in the browser, manual cleaning requires a lot of work. Apart from the history, the browser also saves the entered search terms or addresses and uses these for automatic completion. You can completely delete this data via ‘Tools | Delete Browser History’ but this also deletes data that you might require. Such problems can be worked around in the new Version 8 of the Internet Explorer simple with the private mode. The mode is especially useful on public computers. 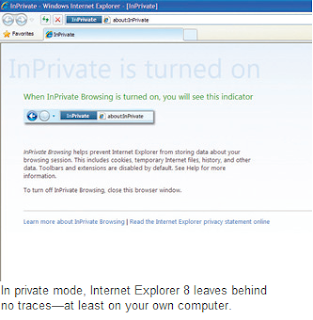 The change in the protected private mode takes place with ‘Tools | Browse InPrivate’. It opens a new browser window. From here on, you can open further tabs or even new windows in private mode. The original unprotected window also remains open. The respective status can be identified from the logo ‘InPrivate’ in the beginning of the address row. All symbol bars and add-ons are switched off in the private mode. History, form data and Information regarding automatic completion is not saved by the browser. It holds cookies in the memory for the function of the website and deletes these on closing the window. Caution: Network administrators can still follow your traces. Besides, keep in mind that favorites added in the private mode as well or feeds are generally retained in the browsers. Note: The new Microsoft-Browser is a part of the normal Windows-updates. You can however also directly download it, from ‘http://www.microsoft.com/windows/internet-explorer/default.aspx’. While installing it, you must adjust a few settings. First, answer the question ‘Activate recommended Sites’ with ‘No’, so that a Microsoft online service does not analyze your browser history, to give you personalized suggestions. Now click on ‘Select User Defined Settings’, to determine important things such as the search engine and default browser. Finally, restart the computer once you have made necessary changes.